It's Friday afternoon; which means there's really no way we're going to receive our referral call this week at all. To say we're disappointed would be an understatement; yet, we know we should count ourselves lucky that Holt is even ready to be making matches for February HSTK (home studies to Korea). So, we are *trying* to "keep calm and carry on". Today on one of the Holt online forums, I saw a picture of a baby boy who had just been matched with his family on August 2nd. He was adorable and chubby and had a big tuft of black, wispy hair sticking nearly straight up on top of his head - SO CUTE! I realized that he is probably close to the same age and size as our wee one will be when we get our call - that really hit home! As much as I want to see our child's face NOW, I know that God has a perfect plan and always has. So, I try try TRY to be patient every day and not look at my phone a million times or check the online forums every quarter hour to somehow, someway discover something I didn't know 15 minutes prior. It is really difficult, but I try to remind myself that waiting for referral will probably be a thousand times easier than waiting for the EP (emigration permit) or TC (travel call). 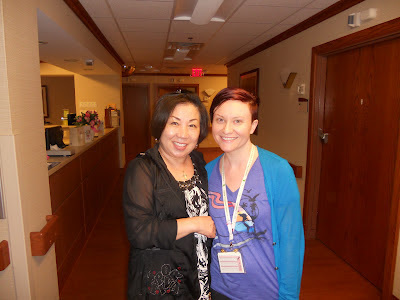 Two days ago, I was heading up to mom's hospital room when I ran into Pil (pronounced Pia) who is the Korean wife of Thomas (a fellow cancer fighter who will be receiving his stem cell transplant on the same floor as mom in about a week). She had made a bunch of food, but we were late in the game and missed out on getting to try some of it. BUT, she did take a picture with me and agree to chat more about Korean culture and food when Thomas comes back for his transplant. She also shared directions on how to get to one of her favorite Korean markets; which happens to be quite close to Zion in the town of Gurnee. Mr. C and I have wanted to go there for a while now, but it's hard to coordinate a time since we are either here at the apartment caring for my sister or at the hospital caring for mom. But we are hoping someday soon we'll be able to go check it out. Pil and I in the CTCA stem cell unit. Please forgive my face - I had not one drop of makeup on, and I look scary! Waiting has to be so hard! I was going to tell you that I once brought a couple of Korean adoptees to a Korean Culture Camp that their mom sent them to every year in Minneapolis. I don't know if the camp is offered only in the Twin Cities or if others like it are available country wide. I felt out of place there having grown up in white suburbia but the girls really enjoyed it. There were SO many Korean kids there from all backgrounds. They learned Korean traditions from dance to food to language. Your little one might enjoy something like that someday.